Providing both heating and cooling through a single device – a heat pump.1 Heat pumps have been used, mainly in Southern climates, for decades. Allowing for Different Climates for Each Room. Each indoor unit can provide customized heating and cooling -- adjustable through wall consoles, remote controls and smart phone apps -- in each conditioned space. Cutting heating costs in half compared to conventional electric heating systems. Because they transfer instead of generate heat, ENERGY STAR certified ductless mini-split heat pumps use 60% less energy than standard home electric resistance-based heating systems. Cutting cooling costs by 30% compared to conventional room air conditioners. ENERGY STAR certified ductless min-split heat pumps use more sophisticated compressors and fans that can adjust speeds to save energy. Homes with costly electric heat (e.g., baseboard; furnace; wall heaters; electric radiant) that will also benefit from cooling. Older homes with no ductwork (e.g., radiators or baseboard heat) that never had central air conditioning before. Homes with expensive central heating systems due to high fuel costs or low system efficiency. Additions or outbuildings (e.g., shed, barn, garage) where extending ductwork or cooling/heating capacity is not feasible. Rooms that are not regularly occupied (indoor unit can be turned off to save money). Spaces adjacent to unconditioned spaces where ductwork would be exposed to harsher temperatures (e.g., a guest room above a garage). New construction of homes in areas with high fuel costs. Older commercial buildings with no existing ductwork for air conditioning or expansions. In the past, people worried whether heat pumps were good at providing heat in cold climates. As temperatures drop, the heat pump must work harder and harder to extract heat from the outdoor air. Some heat pumps now utilize advanced compressors and refrigerants that allow for improved low temperature performance. If this is a concern, look for ENERGY STAR models with a Heating Seasonal Performance Factor (HSPF) of over 12.0 BTU/Wh4 or examine a list of ductless mini-split heat pumps designed to work in colder climates developed by the Northeast Energy Efficiency Partnership (NEEP). Another concern may be the aesthetics of the relatively large indoor floor or wall mounted units. U.S. consumers, accustomed to having heating and cooling delivered from barely noticeable vents in walls and ceilings, can sometimes find the look of the indoor wall or floor mounted units unappealing. Ductless system manufacturers offer ceiling-recessed and short-run horizontal, duct-based air handlers, to provide a look some U.S. homeowner are more comfortable with. ENERGY STAR certified ductless heating and cooling systems are eligible for rebates from some local utilities -- up to $1,000 per unit depending on what system is being replaced. A list of available rebates can be found here. 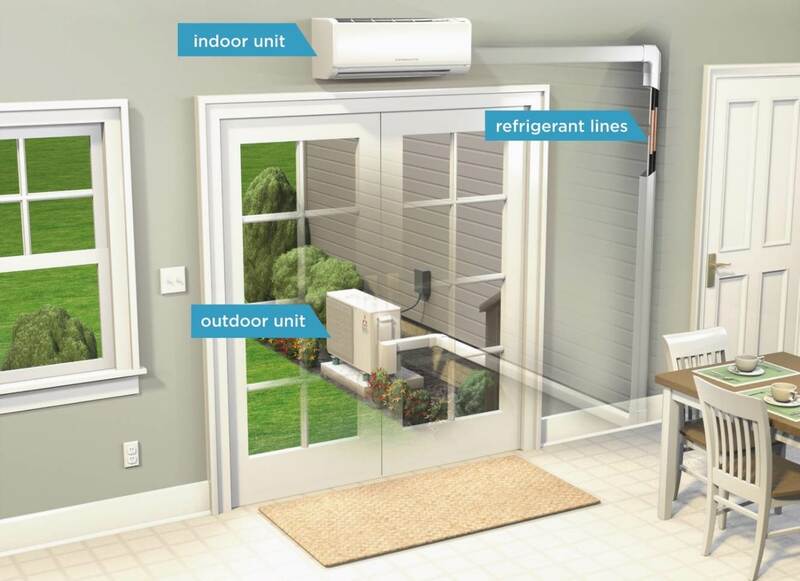 1In the summer, a heat pump uses a refrigeration cycle to move heat from your home to the outside just like an air conditioner. In the winter, with the refrigeration cycle run in reverse, a heat pump moves heat from the outside into your home. 2 Indoor unit is an air handler circulating room air across refrigerant coils. 3 Outdoor unit is a compressor responsible for keeping coils hot or cold. What else should I look for when buying a ductless heating and cooling system? If you've decided that you want to purchase, learn how to hire a contractor and get an ENERGY STAR Quality Installation. Remember, even though ENERGY STAR certified products can be more expensive to purchase up front, the cost difference will be paid back through lower energy bills. The installation is relatively straight–forward; many contractors familiar with the technology find it easier to install than traditional heating and cooling systems. However, although this technology is widely used around the world, many contractors in the US are still unfamiliar with it. Be sure to search for a well–reputed contractor familiar with “ductless” or “mini–split” systems—the engineering terminology for mini–split heating and cooling. It may be useful to look for contractor that works in the commercial market as well as the residential market. Remember to schedule regular maintenance of your heating and cooling system to prevent future problems and unwanted costs. The easiest way to find a model is to ask a professional installer for an ENERGY STAR certified model. Be sure to shop around for a well–reputed contractor familiar with “ductless ” or “mini–split ” systems. ENERGY STAR offers tips on how to hire a contractor and get an ENERGY STAR Quality Installation. A list of ENERGY STAR certified models is available through an online database maintained by the Consortium for Energy Efficiency (CEE) and the Air–Conditioning, Heating, and Refrigeration Institute (AHRI). TIP: click on "Find Variable Speed Mini Split and Multi Split" heat pumps or air conditioners. It is important to know that this directory search engine does not require data to be entered into all of the fields. Heating and cooling costs the average homeowner about $875 a year — nearly half the home's total energy bill.